With the play, The Amber, starting a new run in Beijing on March 17, Liu Ye, who reprises his role as the protagonist, is once again in the spotlight. Liu Ye was just 26 when he played the lead in the original staging of The Amber five years ago. Now at 32, he is more talkative and open, and more generous in his answers to sensitive questions. Q: It seems that your love life always draws public attention. A: People paid attention to me because my ex-girlfriend was an actress. 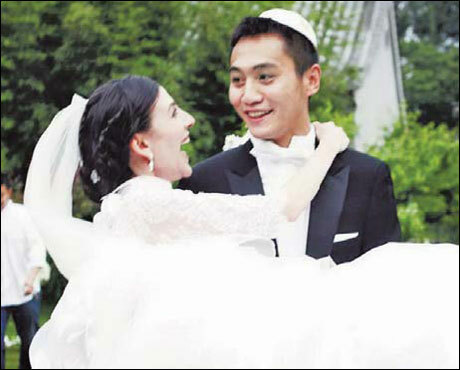 Now, I draw attention because my wife is French, which is rare among Chinese actors. People are curious about it. Q: So why did you marry her? A: We decided to get married because we share traditional views of the family. I am over 30 and she is one year younger than me. I want to be responsible for her and marriage is a promise. I would have spent the rest of my life with my first girlfriend, if she hadn't broken up with me. That's just part of my character. Q: Is family important to the French? A: Well, she is Jewish. They have similar views to the Chinese about the family. Q: Your wife is a career woman. Is she very independent? A: Yes, very much so. She hasn't used the credit card I gave her for one whole year. When she dines out with her mother, they pay the bill in turns. She is not richer than me, but she still doesn't want to spend my money because she says that I would subconsciously think her inferior if she did that and we would not be equal any more. I think she makes a good point. Q: Do you have cultural differences in your daily life? A: Yes, but I think it is good to have cultural differences because it is hard for us to have any fights. For example, if I speak fast when we have dispute, she will ask: "What did you say?" If she tries to argue in Chinese, she cannot be fluent and I think it's so funny that I don't want to fight any more. Q: What attracts you most about your wife? A: She is a very nice woman. She gives me lots of peaceful feelings. She likes reading and has read many classics. She likes Israeli and Russian music. She likes films and often introduces Jean-Luc Godard and Pedro Almodovar movies to me. She asked me to watch a French movie recently. At the beginning of the movie, I thought it was not exciting at all, but later on, I got into it. She doesn't like Hollywood movies and thinks they are silly. I always sleep well beside her. I suffered from insomnia before and pills or drinking didn't help, but after we got together, I always sleep very well. That's good. Q: Did she know your previous relationship? A: She knew all of it. All she had to do was go online and search my name. It's all there, all the information. However, it's history. We are both open with each other. A: Yes, we do. Many of our friends have already had babies and we want one too. But we both have big eyes and a big nose, so I worry that my kid's eyes and nose will be too big. Q: Do you think you have changed over the last five years? A: Sure. I can do things by myself now. I can discuss things with my boss, producers and directors without my agent. I don't need any assistant in the production team, either. Before I didn't know what to say to others. Now I like to lead the conversation and choose the topic. Q: Do you still like drinking a lot? Why don't you want to learn driving? A: I tried to quit drinking two months ago, but many of my friends knew I liked drinking, so they always prepared lots of liquor when I visited them. I didn't want to disappoint them. Driving is distractive and I like thinking about things in a car. A: Scuba diving. I have taken hundreds of pictures underwater. I learned this from my wife. Chinese like spending the money on food and cars or a trip to Las Vegas when they become rich, but people like my wife don't. She is from a middle-class family. She likes scuba diving and climbing ice-covered mountains. Her hobbies are so cool. She has made my life more interesting. Q: Have your age and changes in life influenced your acting? A: I was 26 when I first got the script of The Amber. Now I am 32. The feeling is different, I can put more into the lines now and feel more confident. The ending of the play has changed this time. My character dies this time instead of singing as in previous versions. Q: Any future plans to work with Director Meng? A: We are discussing the possibility of a movie. In addition, the French Embassy wants to support us to make a French movie I feel very excited working with him. Q: What do you look for when choosing a project? A: The director is the most important element, the script the second. Then, the timing and the pay should be suitable. It is untrue to say I would not consider the money at all. Q: Which other directors would you like to work with? A: Lou Ye, Ding Cheng, Lu Chuan, and Zhao Baogang. I have acted in their works before and would be very happy to work with them again.